Mr. Pip, the movie, has arrived in Papua New Guinea, with its official release on Thursday. 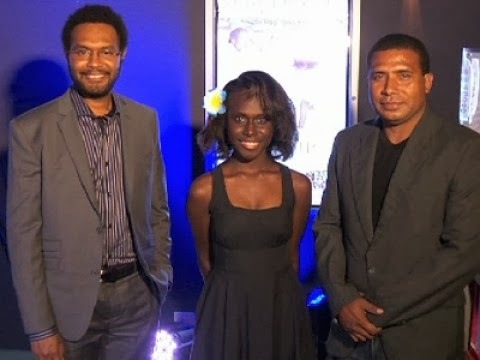 It was definitely a night to remember, as young talent, Bougainvillean star Xzjannah Matsi graced the PNG Premiere at Paradise Cinema in Port Moresby. This Hollywood standard movie is a film adaption of the Book Mr Pip, a moving story set against the backdrop of PNG’s history, the Bougainville crisis. Xzannjah Matsi is an example of pure Papua New Guinea talent, a star in the making from the Autonomous Region of Bougainville. She plays Mathilda, a key character in the movie. Officially releasing the movie at the Paradise Cinemas at Vision City Shopping Mall in Port Moresby, she stood beside other Papua New Guinean actors Tidman Ikosi and Calextus Simeon, who also play parts as PNG Defense Soldiers. Speaking at the PNG Premiere Q&A, the actors delighted in discussing the importance of the movie reflecting on a significant time in PNG’s history – the Bougainville crisis, and the future of PNG’s film industry. Also at the Premiere was NCD Governor Powes Parkop. The PNG Premiere was held together with a combination of efforts from the PNG entertainment industry including the PNGFM team. More highlights of this event were captured by EMTV’s In Moresby Tonight program.